Malibu Pointe is a new, Caribbean-inspired condominium building with modern amenities. 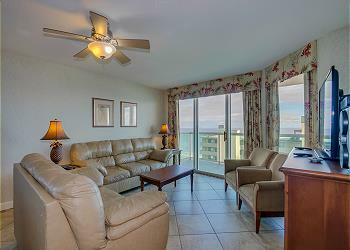 All bedrooms have a 25" flat screen TV and each living room boasts a 42" LCD Flat screen HDTV. Malibu Pointe is a new, Caribbean-inspired condominium building with modern amenities. All bedrooms have a 25" flat screen TV and each living room boasts a 42" LCD Flat screen HDTV. Each unit features a fully-equipped kitchen with stainless steel appliances and granite countertops. Appliances include built-in microwave, dishwasher, flat top stove, side-by-side refrigerator with in-door water and ice. Also included in each private villa are a full size washer and dryer and computer with Internet access. The master bedroom balcony boasts gorgeous views of the Atlantic Ocean and the master bath features a separate luxurious Jacuzzi tub and shower for ultimate convenience and relaxation. Property amenities include outdoor and indoor pools, hot tub, lazy river, kiddie pool, game room/arcade and a glassed-encased exercise room with a wonderful view of the ocean and the pool areas. Enjoy ultra modern luxury with all the comforts of home at Malibu Pointe.